Festival recipes reminds us of childhood, grandmothers, sweets and family time. In these days of the nuclear family, grandchildren are not always able to spend time with their grandparents. Hence Smt Satyakala and Sri Rambabu have decided that every Ganesh Chaturthi, they would travel to their son’s place so that the grandfather, son and grandson perform the Pooja for Ganesha together no matter where they stay in India. They have travelled to Bangalore, Gurgaon and this year to Hyderabad to their son’s place to uphold the established tradition in the family. This post is a tribute by their daughter-in-law, Aruna. She shares the Prasadam thali that was prepared this Ganesh Chaturthi by Smt. 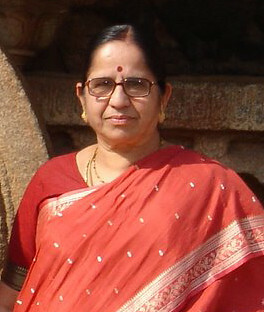 Satyakala, whom she refers to as Athagaru. While most Poojas are performed either by couples or by the women of the household, Ganesh Chaturthi Pooja is traditionally performed by the male members of the family in a traditional Andhra household. The onus of preparation of the Prasadam and decoration of the Pooja altar is, of course, left to the women folk. Each Andhra household, rather, each Hindu household, has their own family FESTIVAL RECIPES which they prepare on the occasion of Ganesh Chaturthi, the festival dedicated to the elephant God Ganesha. From childhood, the importance of this day has been implanted in my mind. Ganesha is much-loved for he is considered the remover of obstacles & bestower of auspiciousness. In a traditional Andhra households, Kudumulu and Undrallu are prepared although there may be variations in the recipes. The other items are entirely family specific and I am always amazed at the variety that can be seen from family to family. In our family, in addition to Kudumulu and Undrallu, Pulagam and Pachipulusu are compulsory additions to the menu. The Sweet dish and Pachchadi in the Thali may change each year. Below is the picture of this year’s Ganesh Chaturthi Thali as prepared by my Athagaru. As always, we enjoyed the dishes prepared by her. The same taste, same consistency, same flavours year after year. The Thali consists of Kudumulu (Modak), Undrallu, Vankaya Pachipulusu, Payasam, Tenkapachchadi and, of course, Pulagam. Modak is a sweet dumpling which is supposed to be the fovourite of Lord Ganesha. The sweet filling is made of fresh coconut and jaggery while the shell is of rice flour. It is called Kudumulu or Jiledu kayalu in Telugu. Undrallu is prepared with coarsely ground rice. Traditionally, the rice is washed and dried in the shade the previous night. The next day it is ground coarsely sieving away the fine powder. Today however, some of them grind the raw rice to make Undrallu instantly. The rice is cooked along with Bobbarulu (Cow peas/Lobia) just right to make nice big balls of Undrallu the way it is loved by Lord Ganesha. Undrallu are traditionally accompanied by Tenka Pachchadi. Vankaya Pachipulusu is made by roasting brinjal on fire. The pulp together with tamarind juice and tempering makes a tasty accompaniment to Undrallu and Pulagam. Payasam is prepared with Semolina and sugar. My mother-in-law cooks the semolina and sugar together and adds hot milk to it just before serving. This way, the semolina mix can be stored in the fridge without getting spoilt and hot tasty payasam can be enjoyed as and when required. The quantity of the milk can be altered to suit individual’s taste. Tenka Pachchadi is prepared with dried mango pieces by soaking them in warm water and grinding them with coconut, coriander leaves and green chillies. The mixture is later added to beaten curd. Pulagam is prepared during any religious occassion as Prasadam. This is prepared with rice and washed moong dal and served with Ghee. Pulagam is generally enjoyed with Vankaya Pachipulusu. September 3rd is my mother-in-law’s birthday. Happy birthday Athayya. Looking forward to many many more years of enjoying the Ganesh Charturthi recipes prepared by you. Hope you enjoyed this recipe. Click to read many more such heartwarming tributes and recipes. Share a few lines about your favourite family recipe in the comment form below. The joy of documenting tribute recipes is an experience in itself. It connects generations.